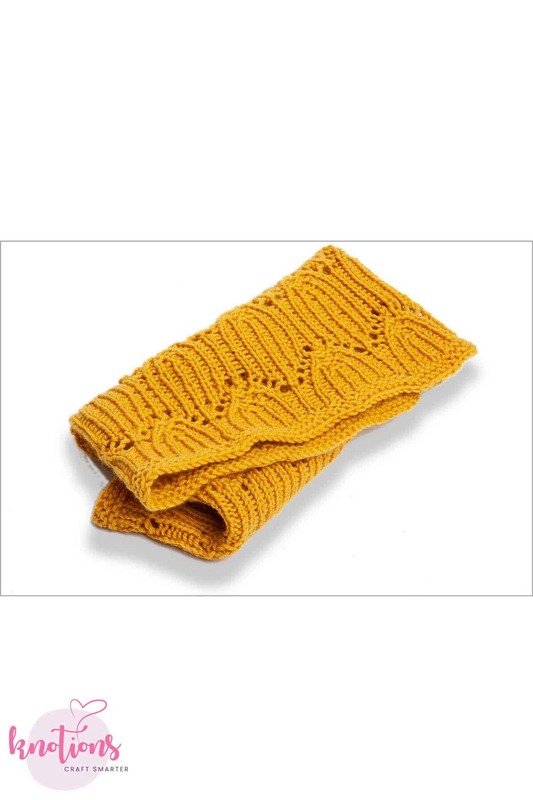 The lace in this cowl is reminiscent of the shape of the cockleshell flower. Growing up, I read The Secret Garden so often my copy fell apart. Near the beginning of the book, “Mistress Mary” is used as a taunt against the main character, but by the end Mary is more of a free spirit and tends to the garden in the book’s title. 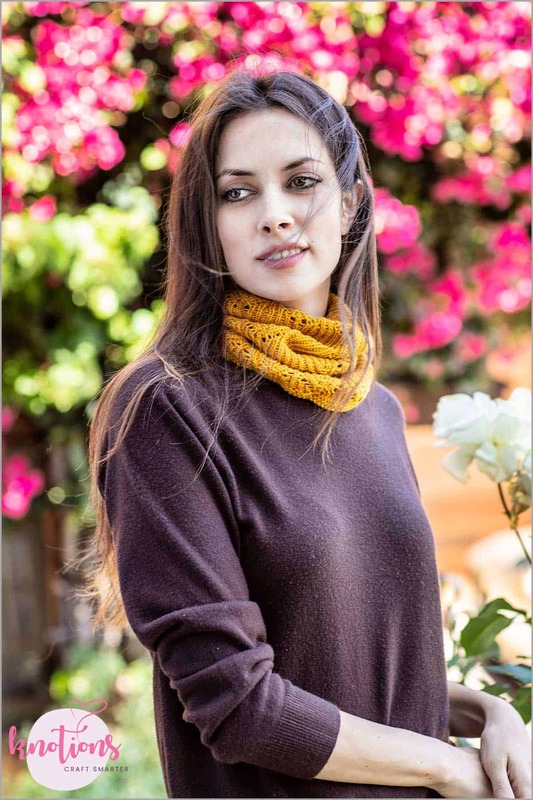 This cowl is an intermediate knit. It is long enough to be pulled up and cover the face against chilly autumn winds, yet is also light and can be stuffed away in a bag if the day warms up – as adaptable as the plants in The Secret Garden. Thanks to O-Wool for providing yarn support! 21 sts and 31 rows = 4” [10 cm] in St st after wet blocking and pinning to dimensions. 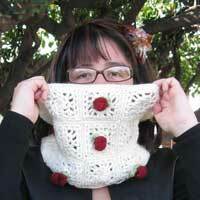 The lace stitch used in the cowl is a ribbing-based stitch, so the cowl is very stretchy. For a cast on that is as flexible and stretchy as the lace pattern, use the Chinese Waitress Cast on or the knitted cast on. 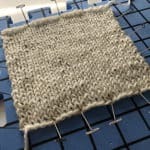 For a wider cowl, cast on extra multiples of 12 sts. 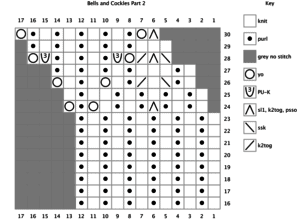 For a taller cowl, work extra repeats of the Bells and Cockleshells Chart. The charts are presented in two parts to make it easier to print. 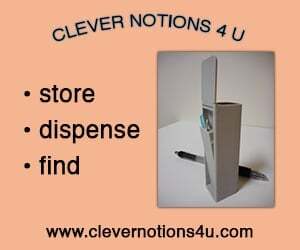 Click to enlarge – NOT in the PDF. Rnd 9: Yo, p1, yo, k1, p1, k1, p1, sk2psso, p1, k1, p1, k1. Rnd 10: K1, p1, k2, (p1, k1) 4 times. Rnd 11: Yo, k1, p1, k1, yo, k1, p1, skpsso, k1, k2tog, p1, k1. Rnd 12: (P1, k1) 4 times, k2, p1, k1. 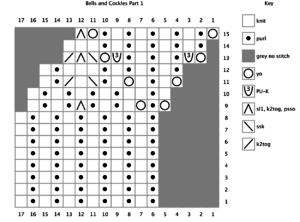 Rnd 13: Yo, PU-k, p1, k1, p1, k1, p1, PU-k, yo, skpsso, sk2psso, k2tog. Rnd 14: (P1, k1) 5 times, k2. Rnd 15: Yo, (p1, k1) 4 times, p1, yo, sk2psso. Rnds 16-23: (K1, p1), 6 times. Rnd 24: K1, p1, k1, p1, sk2psso, p1, k1, p1, k1, yo, p1, yo. Rnd 25: (K1, p1) 4 times, k2, p1, k1. Rnd 26: K1, p1, skpsso, k1, k2tog, p1, k1, yo, k1, p1, k1, yo. Rnd 27: K1, p1, k3, p1, (k1, p1) 3 times. Rnd 28: Skpsso, sk2psso, k2tog, yo, PU-k, p1, k1, p1, k1, p1, PU-k, yo. Rnd 29: K3, p1, (k1, p1) 4 times. Rnd 30: Sk2psso, yo, p1, (k1, p1) 4 times, yo. CO 108 sts using crochet cast on or knitted cast on (see Pattern Notes). Join to work in the rnd, careful not to twist. Place marker to mark beg of rnd. Setup rnds: Beg and ending with a purl rnd, work 5 rnds of garter st (purl 1 rnd, knit 1 rnd). 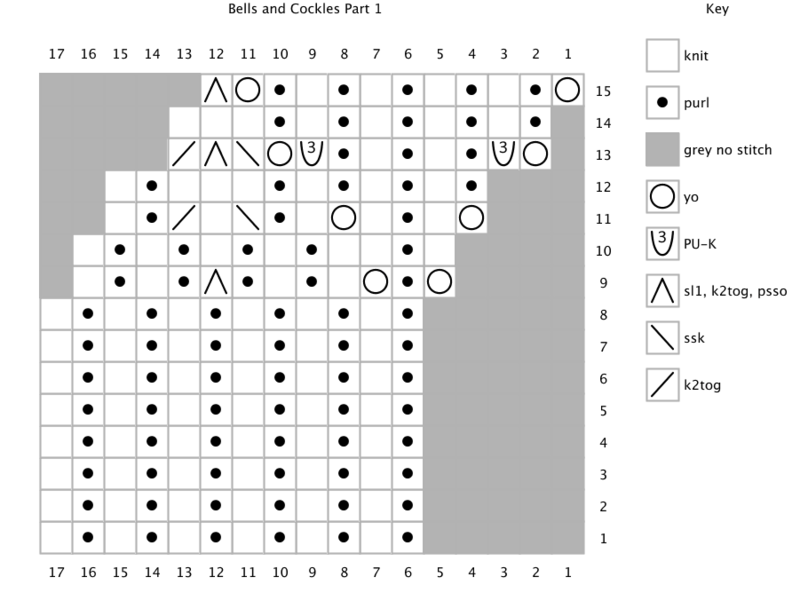 Body rnds: Work Bells and Cockleshells Lace (Parts 1 and 2 if using charts) a total of three times. 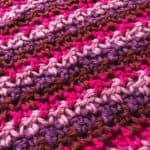 Stitch pattern is worked 9 times per round. 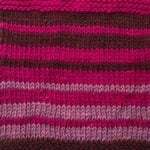 Ending rnds: Beg and ending with a purl rnd, work 5 rnds of garter st (purl 1 rnd, knit 1 rnd). BO as follows: k1, *k1, insert left needle into front loops of 2 sts on right needle, k2tog, rep from * to end. Weave in ends. Wet block, pinning to dimensions. Krystalle Diaz is an environmental microbiologist who hails from the lively desert of Arizona. She taught herself to knit and crochet from books her mom reluctantly bought her when she was 12 years old. Her designs begin as doodles, with inspirational sources ranging from books, architecture, music, shows or movies, and the desert landscape of her home state. She dabbles inexpertly in watercolor and pen and ink art. Her designs can be found at https://www.ravelry.com/designers/deviousrose. 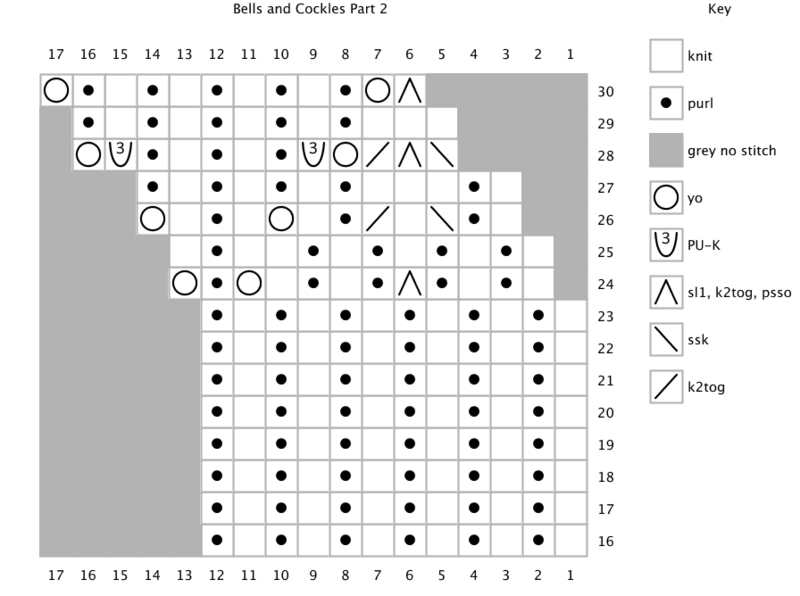 The Bells & Cockleshells pattern has the beginning and end rows described as garter stitch, which is knit every row, not knit 1 row and purl 1 row as printed. Knit 1 row and purl 1 row is stocking stitch and would produce a lovely rolled edge but does not show this in the photo. 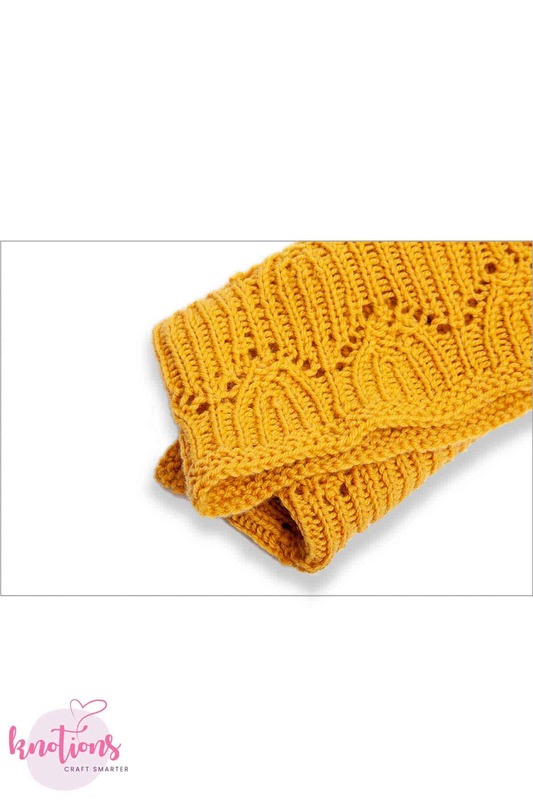 The photograph does show a garter stitch edge – knit every row. given that the garter stitch is in-the-round, we believe this is correct. you’ll work one round of knits followed by one round of purls. 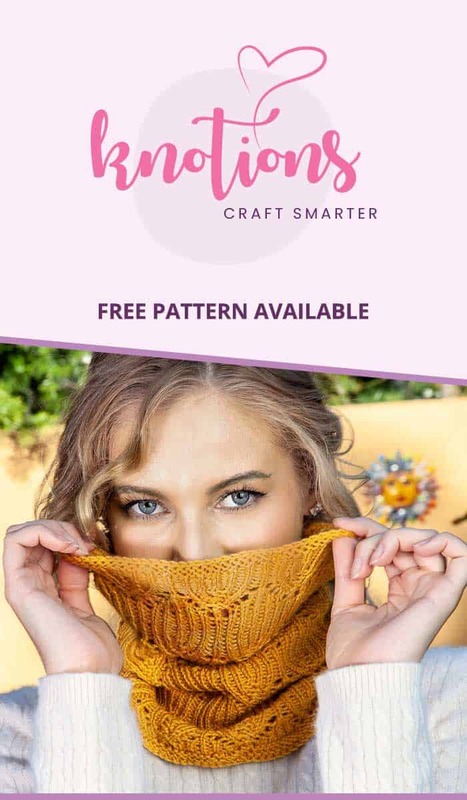 if the garter stitch was worked flat, then this would be just knits. please let us know if you see it this way now or you still feel there’s a problem. we definitely want our patterns to be correct! I do not understand how to work the P-U K stitch, help!! oh no! we have to fix that.